Outdoor living in four distinct areas, wrought with high style and functionality by Archadeck of Charlotte. Outdoor living means different things to different folks. These homeowners meant to take every possible opportunity to be outdoors, whether in the open-air areas, or inside the protection of the screened porch. This luxurious Charlotte screened porch, deck, and patio combination will keep these homeowners outdoors for many a day and many a purpose. Whether private relaxation or entertaining is on the agenda, Archadeck of Charlotte has provided many ways for them to draw full enjoyment and use out of their gorgeous outdoor living space. Increase your time outdoors with a screened porch and Charlotte outdoor fireplace. The Charlotte area climate lends itself to plenty of outdoor living time each year, and these homeowners worked with Archadeck of Charlotte to capitalize on milder “out-of-season” temperatures with a screened porch, complete with outdoor fireplace. This custom outdoor fireplace with stone façade will facilitate warmth and ambiance as cooler temperatures move into our area this fall. Notice how well the stone façade of outdoor kitchen unit and fireplace cohesively bind the deck and screened porch areas! Speaking of the kitchen area, the cook will not be left out of the occasion when duty calls. With a custom bench for friends and family built alongside, the grill master elect will enjoy their time working. Cook, soak up the sun, and enjoy a conversation with loved ones on your Charlotte deck and patio! This beautiful Charlotte outdoor living space not only offers many options for entertaining and leisure, but the variety of building materials really set it apart, giving it a truly custom aesthetic. 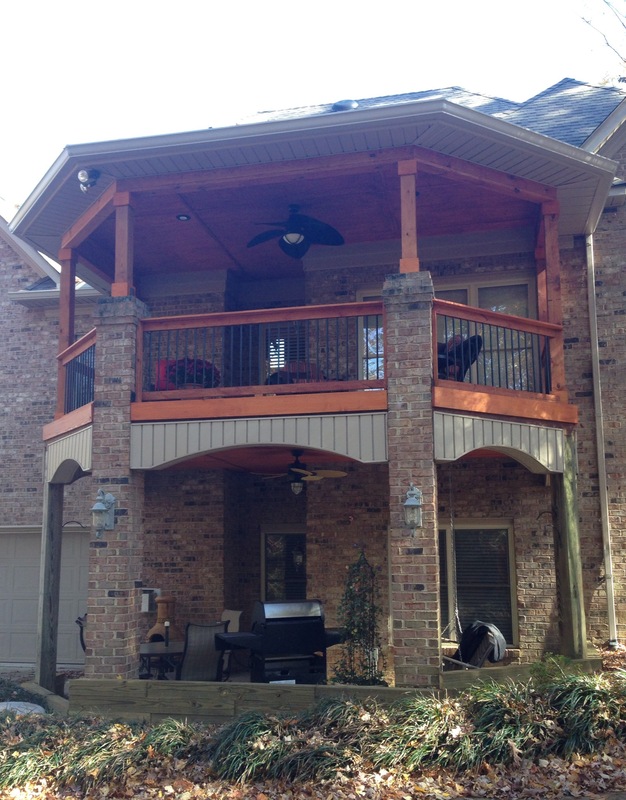 These homeowners will enjoy the low-maintenance advantages of their new elevated Trex deck. The deck and fascia material are Trex Transcend Island Mist, which gives a weathered appearance, playing in perfect complement to the darker deck skirting in Trex Transcend Vintage Lantern. Vintage Lantern is a perfect match to the exterior of the screened porch. 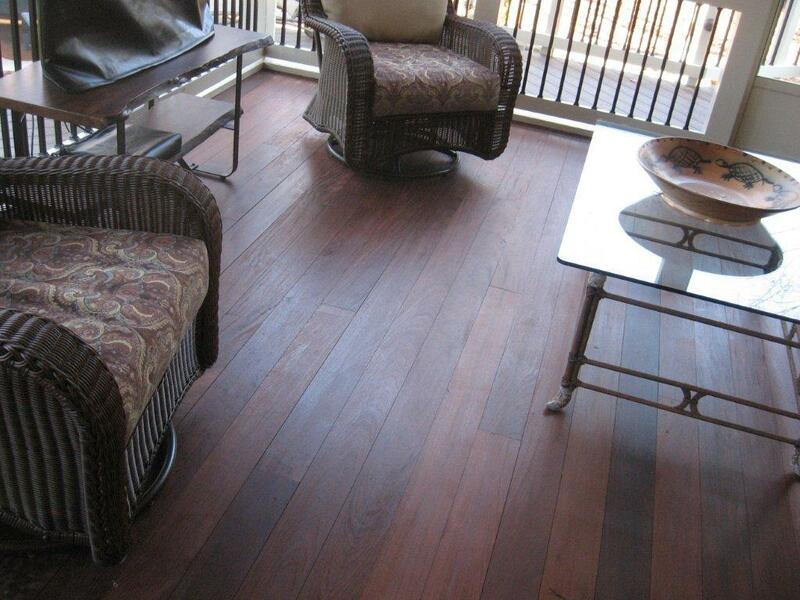 The custom mix of colors, textures, and patters truly set this deck apart! 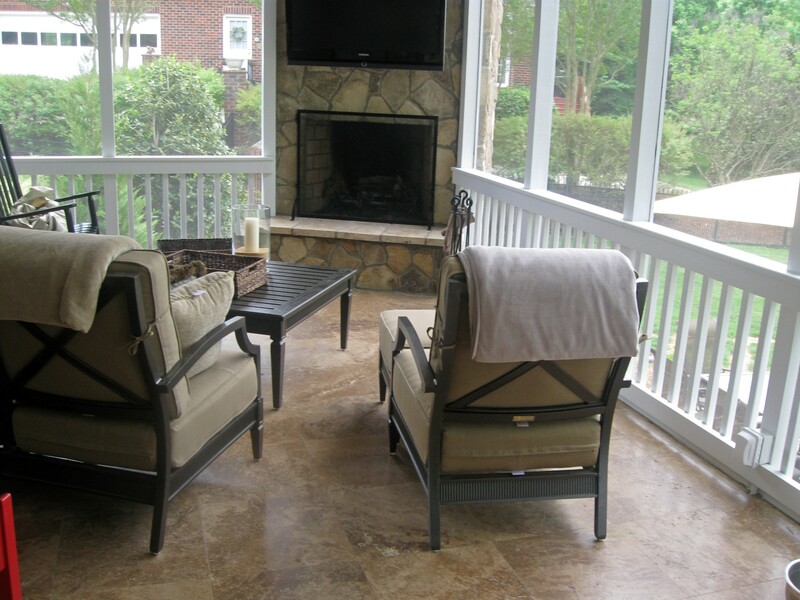 The custom travertine tile patio provides a beautiful and organic staging area for comfortable patio furniture. The patio will provide an area for conversation with friends and family, or a private spot of respite. Imagine a cool fall morning with coffee or tea in-hand, or a starlit evening with a glass of wine! Patios are fantastic transitional areas and might be staged for conversation or even eat-on spaces when entertaining. The beautiful array of colors, patterns, and materials all work in harmony with the home’s original brick façade. Each element – the brick, stone, travertine, and Trex decking materials – lends the whole a feeling of unconventional luxury. 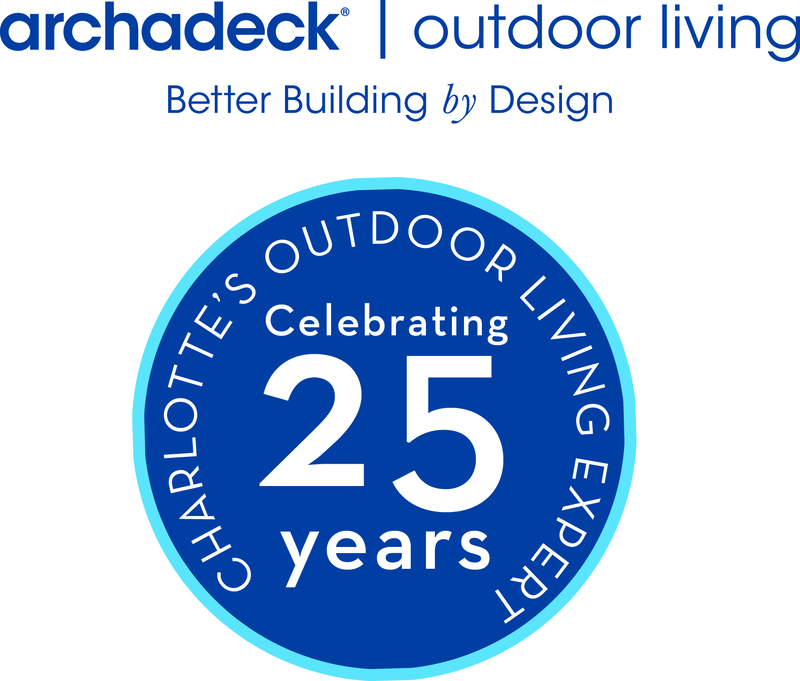 Archadeck of Charlotte can help choose materials for your outdoor living space that will bring an air of custom style with choice low-maintenance and natural stone elements to best suit your design tastes, home, and lifestyle. If you are looking for luxurious Charlotte outdoor living ideas that will allow you more time outdoors with family and friends, give us a call for a free design consultation at (704) 944-1350 or email us and a Design Consultant will contact you promptly. Which Outdoor Fireplace is Right for Your Home in Charlotte? Should you choose a stand-alone fireplace or one integrated into a porch or deck? Outdoor living in Charlotte is nearly year-round. Adding an outdoor fireplace to your outdoor living space will close the gap and create a space that is truly usable in all seasons. But what type of fireplace best suits your needs? There are benefits to all types of outdoor fireplaces, but there are differences that should be considered before you add a fireplace to your outdoor living area. A stand-alone fireplace, though detached from your home, is usually accompanied by a paver or stone patio. A detached fireplace area is a fantastic idea for homes with large backyards, because it allows the homeowner to create aesthetic appeal to an area that would otherwise be unfinished and unused. Stand-alone fireplaces turn boring flat areas of a yard into luxe gathering spaces, where we meet with friends and family for a relaxing evening – just add wine! Custom stone fireplaces are show-stopping focal features in an outdoor living area. Your friends won’t want to leave, and neither will you. Alternately, a detached outdoor fireplace can be tucked away into a quiet or hidden corner of your backyard to create a secluded sanctuary. Imagine walking from your back door to your fireplace hideaway and feeling like you’ve been transported far away from woes and worries of the day. We can help you create a getaway that will not require leaving your home – one that you can escape to any day you choose. If you have considered adding another fire feature, such as a firepit, why not upgrade to a custom outdoor fireplace? If you are looking to expand your family’s use of your backyard, a fireplace will upgrade those plans nicely! If you are seeking a truly custom fire area for your family, a detached fireplace will accommodate. Gather ‘round for daily after-dinner conversation. No one will ever object to a family meeting again if you offer a cozy fireplace area, where cares fall away, and comfort is offered on-sight. If you have a porch area in need of character, adding a custom fireplace will turn your space into a beautiful four-season outdoor room. Porches are essential and practical, but they offer so much more when used as an outdoor room. Adding a fireplace to a porch will add usable time but can also change how you use the porch altogether. Add a TV above the fireplace for catching your favorite shows or have a movie night for the kids at their weekend sleepover! Fall is a perfect time to utilize a fireplace on your porch, mere steps away from inside your home, but lightyears from the outside world. Imagine football games on Saturday and Sunday, wine after Thanksgiving dinner, and hot cocoa and Hallmark movies at Christmastime in your cozy outdoor space. Coffee on cool weekend mornings…the list goes on and on! Adding a fireplace to your covered patio or porch area will augment your home’s livable square footage and encourage use on days that you would otherwise be indoors. A bit of cool weather won’t keep you bundled up inside. Enjoy a good book on cool mornings or evenings. Your sanctuary exists right outside your door! Maybe you prefer open-air to covered porches and patios. If your current deck is spacious and convenient, but you feel it just needs something more, a fireplace will fulfill that requirement. Decks are one of the most practical additions to our homes. We enjoy them for grilling, eating, sunning, and relaxing. Take your relaxation to another level by adding a fireplace to your deck. Your friends will applaud your ingenuity! A fireplace will take your deck from a space of utility, albeit great, to an actual living area. Be creative, add an air of flair and luxury! A deck with a fireplace is a great conversation-starter and gathering spot. Imagine convening for weekly book club or a random happy hour with friends and neighbors. Decks are great investments alone, but with the added usability a fireplace offers, they become so much more! Archadeck of Charlotte specializes in all things outdoor fireplace, not matter your specific requirements. We will work with you to plan, design, and build the perfect outdoor fireplace, and turn your current outdoor space into one of luxurious style. From lavish enclosed porches, to perfect patios of respite and decks that will redefine convention, Archadeck of Charlotte is ready to build the custom outdoor fireplace of your dreams. If you are considering a new Charlotte outdoor fireplace, give us a call for a free design consultation at (704) 944-1350 or email us and a Design Consultant will contact you promptly. We now know that fire features are all the craze in Charlotte, NC. We have seen year over year growth in the category for 10 straight years! The common question people ask is should I invest in a fireplace or a fire pit? How to build an outdoor fireplace? Archadeck of Charlotte has been designing and building outdoor fireplaces for years now. Can a “do-it-yourselfer” build an outdoor fireplace? There is no doubt that someone skilled in masonry, can build an outdoor fireplace. The primary challenges are building code knowledge and even more challenging is the “flu design”. There are specific building codes that have been written in recent years with the growth of outdoor fireplaces from a safety standpoint. It is highly recommended that you get in touch with your local building department prior to your design phase or contact a pro. In terms of flu design, the trick is the flu architecture to ensure that the smoke goes up and out the chimney as opposed to back at you. For more information, you can call 704-944-1350 or go to archadeckofcharlotte.com. To view more outdoor fireplace photos, visit our Charlotte outdoor fireplace photo gallery. Integrating an outdoor fireplace into the screen porch. Whether it’s a wood-burning or gas fireplace, the popularity has grown each year for the past 10 years and counting. The function, beauty, and natural draw to fire have made this something homeowners will splurge on for the outdoor space! Charlotte for the past 15 years. Over the past 5 years, we started advertising them on TV and the idea of extending your outdoor living season is too appealing to pass up. 3. Travertine Tile flooring is another amenity that has seen a tremendous increase in demand. Experience the beauty of the floor, the low maintenance aspect, and of course the feeling that you moved your indoors outside. 4. Lighting is another area where we see more demand. From LED to lighting on a dimmer, people want options to make their screen porch not only functional in the evening but also provide warm ambient light. Here in the south, having a porch is like drinking sweet tea, it’s just what we do. Whether it’s a back porch screened in or open or a front porch, we simply love to spend time outdoors on our porches. Many of us have a porch but would like to make it bigger. The challenge is that most of us have trouble visualizing how to do this with the way the existing roof line is constructed. Call an expert that both designs and builds porches and they can give you a consultation on various means of enlarging the porch. It might mean taking the porch and widening along the back or front of your house or it may mean projecting out further into the yard. The trend today is get away from standard 4×4 posts or columns and go too more decorative columns and larger/ wider columns. If the porch is screened in and normal sized, a 6×6 that is trimed out looks beautiful. If the porch is open without screen, you can even go to an 8×8 or larger if it is a large porch. You can use cedar, fiberglass, or laminated columns. 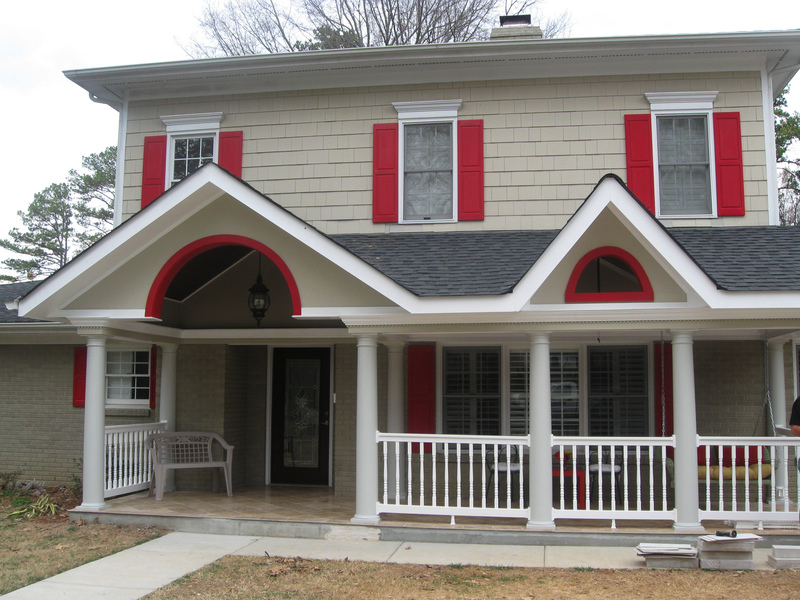 The roof line not only affects that look of the porch, it also changes the feel of space when you are in the porch. By changing the roof line, you may add more height. This can allow more light back into your porch and into your home as well. You can also change the architectural feel of the back of the home. This also allows for a change in ceiling material and perhaps decorative trims. If you currently have wood deck boards on your porch floor as most do, you can add a dramatic difference by upgrading to tile flooring or stone flooring. You can move to a higher end tongue and groove flooring, a Brazilian hardwood such as IPE or Tigerwood flooring, or even throw rugs can enhance the porch!